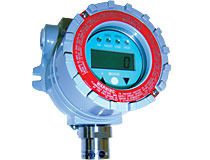 The RAEGuard EC is a permanently mounted (fixed) toxic gas or oxygen sensor/transmitter that operates from a 9 to 36 VDC power source and provides an analog (4 to 20mA) and digital (RS-485) signal output. Housed in an explosion-proof enclosure, the RAEGuard EC is equipped with a local digital display of the gas concentration and function keys for performing calibration. The RAEGuard EC is operated with a standard 4 to 20mA/RS-485 controller or as a stand-alone sensor module.